If you liked this show, you should follow Complexity Talk Radio. Join Dr. Culbreth and guests, Dr. Meghna Bhat, Dr. Veronica Huggins and Dr. Phoneshia Wells, authors and contributors to “Our Voices Our Stories: An Anthology of Writings Advancing, Celebrating, Embracing and Empowering Girls and Women of Color” for a discussion on women of color and healthcare disparities in the millennium and changing the narrative about healthcare for women of color. 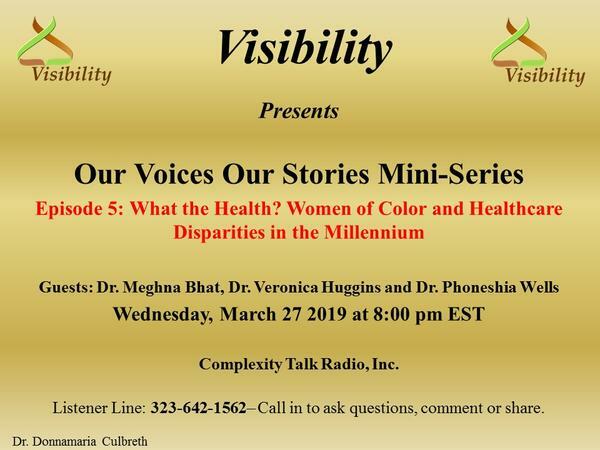 Topics include women of color and quality healthcare, preventative care, understanding and questioning diagnoses, asking questions, second opinions, knowledge, research, trusting doctors, on being heard loud and clear, the importance of using your voice, childbirth, mortality rates, surgical procedures, racism, colorism and disparate treatment in the healthcare industry. Additional topics include strategies to empower women of color to take control of their health and make informed decisions.